And how to prepare for 2017. The web is a dynamic place and websites must change as the visitor’s habits and demands change. 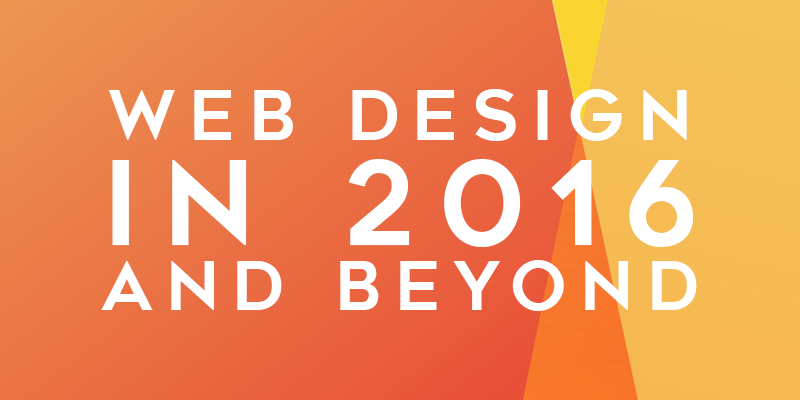 To meet this challenge, web designers monitor the trends to tweak their sites, while at the same time, they try to predict the upcoming trends as well. How can you lead the pack if you don’t know where it’s going? In 2016, websites changed quite a bit. It wasn’t only out with the old and in with the new. In fact the Internet went through some huge changes in 2016 that heralded lots of new opportunities. Connections have gotten faster. More information has been gathered about how people use the web as a whole and we now have the “internet of things” which means more and more devices are connecting to the Internet that allow people to do many more activities through a connected world. However, even in the days when we have smart refrigerators and toasters, there is still a need to get information through websites. What comes out of this revolution helps designers to make sites more responsive to the trends and better able to attract and hold the attention of the web surfers. Here are a few of the changes we saw in 2016. Internet Explorer Finally Bit the Dust for Good. In our opinion, the biggest “new” development in web design has been the very timely demise of Internet Explorer. As web designers, we don’t miss the days when everything was tested in working in all the other browsers but then failed in IE. Microsoft ceased supporting the older versions and has gone on to replace it with a new browser included in Windows 10. Responsive Design is Pretty much Everywhere. With people using the web on smartphones more than ever before, websites have adapted to be responsive. This has changed the way people think about web design in general and has made the web a more user friendly place as it has tried to keep up with mobile apps. In the beginning, websites were pretty clunky. Navigation was page to page in a horizontal format. It worked for the time, but with the advent of the mobile device and the explosion of people using their mobile devices in ways they used to use a desktop, websites had to change to accommodate them. And accommodate them they did. The mobile-friendly website became the standard to strive for. Pages are longer and contain more content that is is stacked vertically making it easy for people to swipe up to show the next part of the story. Phones are almost entirely swipe screen now and it’s easier to swipe the screen than to click and wait for the next one to load. Card layouts became extremely popular in 2016, thanks in part to Pinterest. They are great because they keep little chunks of information in a confined space. These small bits of information end up acting as little content containers. They help keep the information on the page organized and users can stack them on their screen. It’s a tad bit reminiscent of the Windows 8 and 10 designs, and it works very well with mobile devices. With browsers becoming more standardized around the relatively SVG (which stands for Scalable Vector Graphics) specification, many companies have used SVGs to create flash like animation and crisp icons/page layout elements that are very sharp on today’s 4K and higher displays. This is an awesome trend that we hope continues. Typefaces have gotten bigger and less stodgy. The fonts chosen in 2016 are seen as more fun and engaging to the visitor, plus they create a more readable display. Along with this, the color schemes of websites are more vibrant and bright, drawing visitors in with engaging text and small animations. You want people to sign up to your site, whether it’s for your newsletter, new product announcements, or a sales alert. But the visitors no longer want to sign-up using old school web forms. It takes too long, and if they are on a mobile device, it’s difficult. Websites in 2016 have increasingly moved to interactive sign-up. This lets visitors use their Facebook or Google accounts to do the work for them. If you have not yet updated your website to include these things, you may want to start. If you’d like to give your website or marketing a boost be sure to contact Web Pyro today!